If you or your group of friends or family have a particular expeditionary goal or perhaps simply wish to keep your climbing group small, we recommend you arrange a private program with us. We have conducted many private programs and our guests have always found them to be the most rewarding way in which to climb. There are a great range of climbing objectives in Peru. The Cordillera Blanca offers the largest selection of varying climbs from introductory glacier climbs to as hard as you might want to try. The Cordillera Huayhuash, more remote and even sharper summits offer generally more technical climbs but incredible trekking opportunities. We have also traveled to the Cordillera Vilcabamba near Cusco. 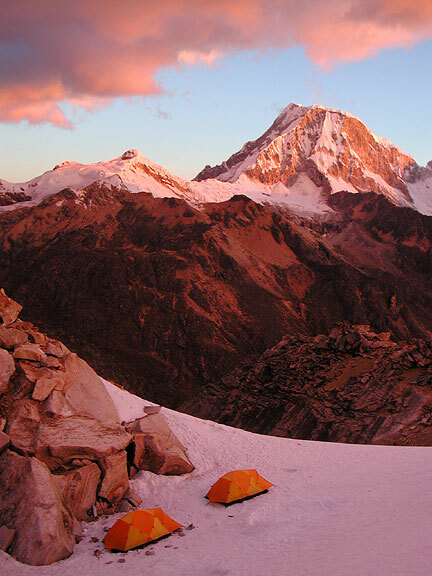 Hear the climbs are big, such as the difficult Salcantay, but as with the Huayhuash the trekking is spectacular, including jungle and alpine alike. The Cordillera Vilcanota, also near Cuzco, offers a drier climate and more open terrain. The climbing opportunities here are immense with the most significant summit being Ausangate. First is flexibility, you can do what you what when you want. A complete change of plans can normally be easily accommodated. Complete adjustment to individual needs for acclimatization, fitness, or just plain curiosity. A private program allows you to maximize your climbing potential by avoiding being held back by other climbers on your trip. Safety and speed. Lower ratios are generally safer and can move faster in alpine terrain. Food, your favorite wine, how you like your coffee, all tailored to your personal preferences. Cusco, Machu Picchu and the Sacred Urubamba Valley A visit to the Cusco area can be added easily to any Peru or Bolivia trip. There are daily flights between Lima and Cusco as well as from La Paz, Bolivia. Normally, you will want at least 3 days to visit the major Inca sites. A good plan is to spend your first day in Cusco visiting the sites there. On the second day you could travel to Pisac and later in the afternoon to Ollantaytambo, spending the night there. On the morning of your third day you can visit the ruins in Ollanta and then continue downstream to either Aguas Calientes or the hotel at the Machu Picchu ruins. The forth day can be spent exploring the ruins of Machu Picchu and returning to Cusco. A visit to the Cusco area is a great way to begin your acclimatization for further climbing. Inca Trail Another option in the Cusco area is to hike the famous Inca trail. Normally the trial is hiked in 4 days, leaving Cuzco the morning of the first and arriving in Machu Picchu late morning on the fourth. This gives you the afternoon to visit Machu Picchu. You can still return to Cuzco on the day four, though it makes for a long day. Ishinca Valley, Cordillera Blanca Not far from Huaraz, the Ishinca Valley is ideally suited for an introduction to high altitude climbing in Peru. There is a great variety of peaks that surround the valley, some of which are reasonable day climbs while others require a high camp above the valley floor. 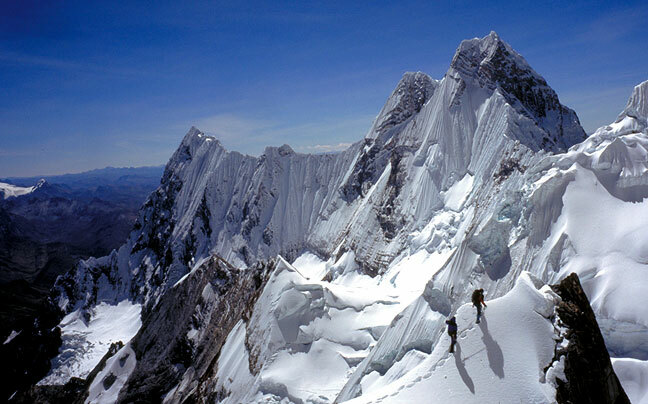 Recommended climbs are Urus Este 17,778', Tocllaraju at 19,785', and Ishinca at 18,138'.